This is the first module of a two-part series offering an introduction to the science explaining catastrophic dam failure and flood-wave prediction methods associated with these events. 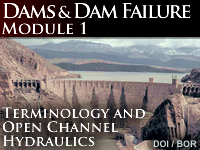 Through use of rich illustrations, animations, and interactions, this module explains key terminology and concepts including dam types and purposes, failure statistics, the general dam failure process, open channel hydraulics, critical flow, Manning's equation, and conveyance. The information covered in this two module series will provide a scientific foundation for advanced course work needed to run dam break simulations and to conduct hydraulic modeling as a part of dynamic wave forecasting. Great lesson, but the hydraulics section is brutal. If you're a CFM looking for credits, this should be worth more than .5. Good lesson but a little difficult. It is difficult to understand and remember the whold knowledge and concepts in few hours for me. it is a very good lesson for improving our knowledge in this field. good lesson for personnel with no hydraulics knowledge. It was way over my head but extremely informative. Was I allowed to review the material after the quiz? I am man of many hats, fema manager being one of them, and these trainings are top notch. Good module for the professionals engaged in water resources sector and want to understand the basics of dams and various flow equations. This was a good introductory course with a great deal of good baseline information.